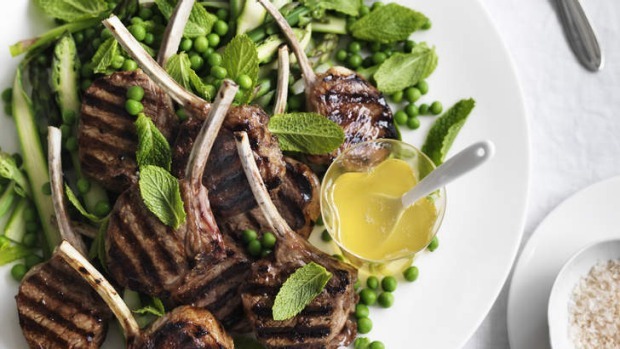 Barbecued or grilled, lamb cutlets are fantastic with a classic mint sauce and lots of seasonal greens. At this time of year, nothing is better than peas and asparagus with fresh mint. If you're making the mint sauce, remember - you'll need to prepare it a day in advance. To make the mint sauce, place the apples and 250ml water in a large saucepan over medium heat. Cover and simmer for 20 minutes or until softened. Place the mint and vinegar in a blender and blend until finely chopped. Add to the apples and simmer for 5 minutes. Remove from the heat and set aside for 2 hours to allow flavours to infuse. Place apple and mint mixture into a fine sieve and sit it in a suitable bowl. Cover, place in the refrigerator and allow the juice to filter through overnight. The next day, measure out 500ml of the juice and place in a saucepan over high heat. Add the sugar and stir until dissolved. Bring to the boil, reduce heat to a simmer, and cook for 15-20 minutes, skimming the scum from the surface regularly. Once sauce has reduced and thickened, remove from heat and cool. Preheat barbecue grill plate over a high heat. Lightly brush cutlets in olive oil and season to taste. Place on grill, cook for 3-4 minutes each side, then set aside to rest for 5-10 minutes. Serve cutlets on a bed of boiled peas and blanched asparagus, with mint leaves scattered over and mint sauce on the side. HOT TIP: For a great party canape, brush the lamb cutlets with the mint sauce and serve on a large platter.